Since last year I have been on a quest to clarify how the work I do can be of more value in Atlanta. I love teaching yoga and our community AND feel that we're not reaching so many that can benefit from this practice. Diversity, inclusivity and access are some of the major issues I wanted to address and so, The Dharma Project was born. With the help of some amazing people I have been able to formulate a beautiful vision and mission for our non-profit and now, I am ready to learn the skills needed to grow our organization in the most beautiful and impactful way. 70 people applied. 20 finalists. 8 fellows selected! 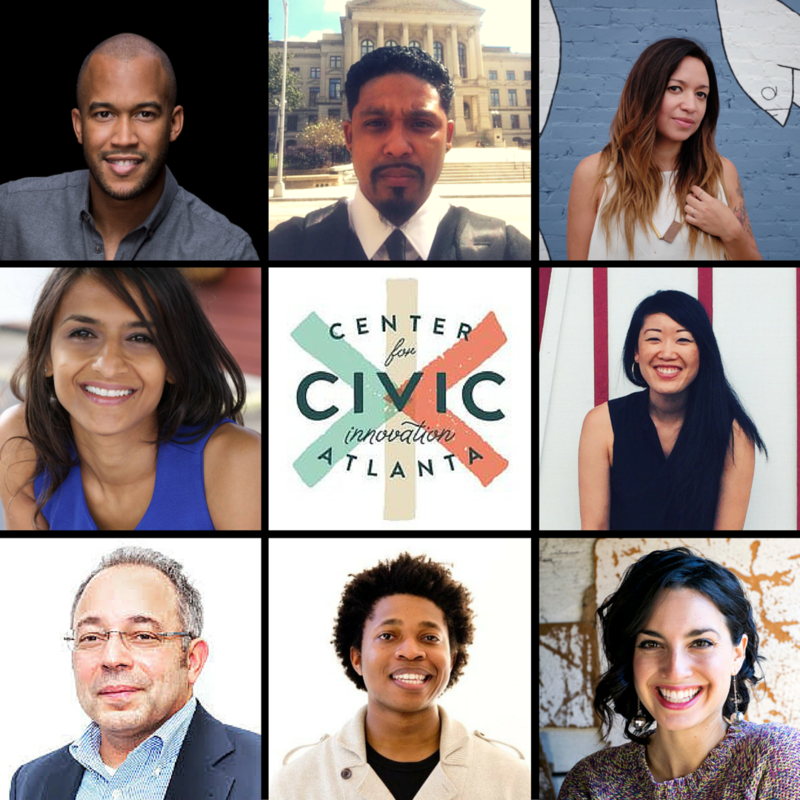 I am thrilled to be a part of this amazing cohort of individuals embarking on six months of mentorship for their social enterprise with the Center for Civic Innovation. From the first panel discussion I attended at CCI, I knew I needed to somehow be involved with this organization. Now I get to study and learn from some of the finest in the city. Here is the story of the eight social entrepreneurs that were selected for the inaugural Civic Innovation Fellowship. I get to spend the next six months with these amazing people! To read the entire story click to this link. Alexander Acosta, Soul Food Cypher: Soul Food Cypher utilizes the power of freestyle rap and lyricism to transform the lives of individuals and their communities. They are an organization that showcases the positive aspects of hip hop culture through our cypher events, membership program, and community outreach. Joshua Brown, The Center for Children with Incarcerated Parents of America:The Center for Children with Incarcerated Parents of America is a minority and veteran operated community-based organization whose mission is to divert parental and intergenerational incarceration, by helping at-risk, low-income individuals to stabilize their lives economically and reach their leadership potential in the community. Monica Campana, Living Walls, The City Speaks: Living Walls seeks to promote, educate and change perspectives about our public space via street art. With their mission we aim to address blight, neglected public spaces, connection between people in their communities, and access to free thought-provoking art in the public space. Rutu Chaudhari, The Dharma Project: The Dharma Project's mission is to educate, empower, and employ populations that face financial and/or social barriers to the transformative power of yoga. They introduce vulnerable populations to yoga and healthy lifestyle practices, and train individuals from those communities to teach yogic practices on their own, creating a cycle of wellness that continues to spread in underserved communities. Marian Liou, We Love BuHi: We Love BuHi envisions a safe, attractive, fun, livable and inclusive Buford Highway corridor. The organization seeks to catalyze the area's revitalization through creative, collaborative placemaking showcasing the area's diversity. Reginald Maisonneuve, eDea, LLC: eDea is dedicated to advancing the financial well-­being of individuals and communities and giving institutions the means to better serve them. Through the innovative use of technology, we define, visualize and quantify financial health to help people understand, achieve and maintain financial well-being. Jeffrey Martín, honorCode: honorCode's purpose is to empower schools to build the capacity for tomorrow's world. They provide curriculum and training to schools to bring more web development into the general K12 classroom. Susanna Spiccia, re:imagine/ATL: re:imagine/ATL is a nonprofit organization that equips youth from all backgrounds to share their stories through multimedia production, activating youth through project-based learning to positively impact their community.